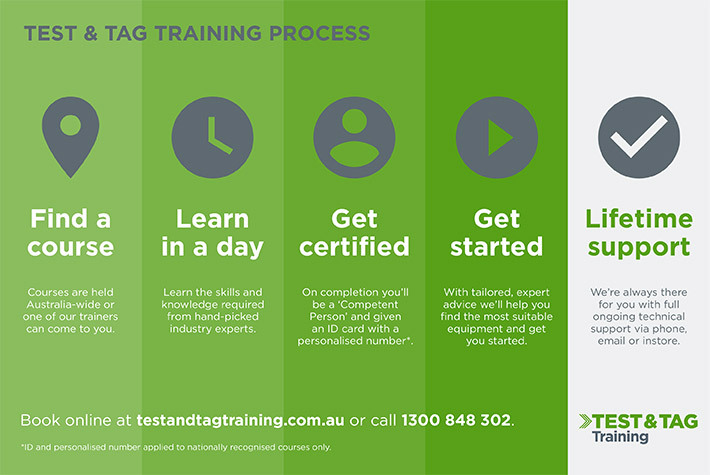 Test and Tag Training is Australia's industry leader at providing training of the highest possible standard, along with lifetime technical support once you're completed. As a Registered Training Organisation, all of our courses comply with Australian standards AS/NZS 3760 and they'll ensure you or your employees are completely ready to test and tag. There are two courses for testing and tagging and both certify you as a 'competent person'. By Australian standards, this confirms you're capable of testing electrical appliances. Our Test & Tag Training process will guarantee you're supported every step of the way. This is the highest qualification available in Australia and has been designed to give you all the skills and competency required to begin testing and tagging. This course has been completed by individuals, large corporations and hundreds of small-medium sized businesses. Qualifications Received Statements of Attainment & ID card with Certificate no. View training venues and available dates. Still unsure of the difference? We can help you choose the right course. The day runs from 8:00am to 4:30pm, with morning tea and lunch provided for you. On the day you'll be provided with everything you need, which includes a manual, pen, notepad and equipment to use (you can also bring your own portable appliance tester). Students must be 18+ years to complete this training. You will be taught in a small-sized class (strict maximum of 12 students) by an experienced test and tag industry specialist. This will ensure you have an interactive learning experience and given all the help you need. The course comprises of both theory and practical, but it does focus heavily on practical hands-on work to ensure you're completely ready to test and tag on your own. Once you have completed the course, we place an emphasis on giving you free lifetime support. We'll be there to provide any technical help you might require, whether it's by phone, email or by coming into our store. Test and Tag Training will teach you how to use the latest and most popular Portable Appliance Testers on the Australian market. For students looking to buy a new PAT, this will give you the opportunity to try a few different options and to choose the ideal one for your job.